Several analyses have addressed the interrelationships of titanosaurs. The published character-taxon matrices for each of the prior analyses can be downloaded in MacClade format below. The anatomical composition of the character data provides insight into the structure of the data supporting titanosaur interrelationships. First, early analyses used no or very few cranial features (i.e., narrow tooth crowns). The description of Rapetosaurus (Curry Rogers and Forster, 2001) and the re-description of Nemegtosaurus and Quaesitosaurus (Wilson, 2002, 2005) provided the first opportunity to discover cranial synapomorphies supporting interrelationships of Titanosauria; later analyses identified many diagnostic cranial features. Owing to the rarity of titanosaur skulls, however, the distributions of these features are not yet well constrained. The recent and upcoming description of new cranial material of titanosaurs (Calvo et al., 1997; Martínez, 1998; Gomani, 2005; Chiappe et al., 2001; Salgado et al., 2005) will allow documentation of these and additional cranial features that resolve the relationships of the group. Second, despite the fact that few complete vertebral columns are known among titanosaurs, axial characters make up the majority of characters determining titanosaur interrelationships. Of these, three-quarters are characters pertaining to the dorsal and caudal vertebrae. Third, appendicular synapomorphies contribute substantial character support in most analyses. These data are relatively evenly distributed amongst the pectoral girdle, pelvic girdle, forelimb, and hindlimb. The relatively high proportion and evenness of distribution of appendicular features may relate to overall changes in limb morphology associated with acquisition of wide-gauge limb posture. The 1,174 characters used by previous analyses can be distilled into a core of 438 independent characters, indicating substantial overlap of character data amongst analyses. 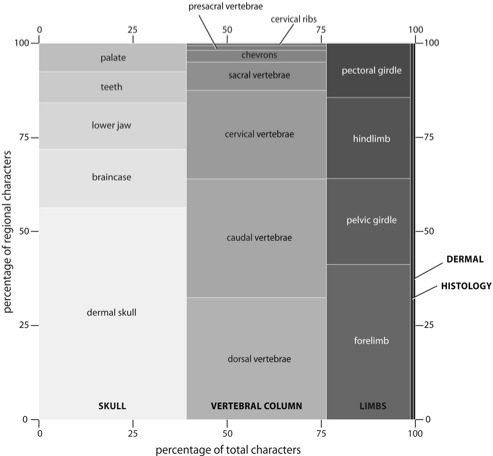 The core characters are predominantly cranial and axial, with slightly fewer appendicular characters; histological and dermal features represent only a small proportion of total character data. A breakdown of the relative proportions of all characters from a given anatomical region or class, as well as breakdowns within regions are given in the figure below. The core characters that represent a starting point for our investigations into Titanosauria. We intend to augment this list with novel characters that we will generate in our proposed collections research. Sample from a compilation of character data specific to titanosaur interrelationships. Data include the character and its states, author-year reference, regional and subregional categories, and the complexity, order, and type of character. Character data from different analyses can be compared, compared, and modified. Data profile of the core character data compiled for phylogenetic analysis of titanosaur interrelationships. The horizontal axis refers to the percentage each anatomical region contributes to total character data; the vertical axis refers to the percentage that each anatomical subregion contributes to character data of a particular region.